This is a photo of men from Walton’s Home Guard during those perilous years during World War II when Hitler’s armies stood poised to overrun and enslave the United Kingdom. Notice how these men do not look like they belong in Dad’s Army, made famous by the BBC television series. These were not doddering old men or even young ‘private Pike’ types. They were young hardened men of fighting age in the prime of their lives. In peacetime they risked their lives to deliver the fuel of the Industry that helped maintain the pride of the nation. In wartime they did the same to support the war effort. Many of them would much rather have been serving in the armed forces, but they were not allowed to. They were forced to continue their dangerous peacetime jobs whether they liked it or not! However, their wives and children would, at least, have been pleased to have their menfolk close by during such difficult and uncertain years. Perhaps, if German paratroopers had made the unfortunate decision of invading Walton they would, undoubtedly, have received short shrift. A gang of armed and dangerous Yorkshire miners with an axe to grind would have been a formidable force. The soldiers of a hostile Wehrmacht would have been greeted by a band of hardened fanatics, desperate to defend their hearth and home. Walton Pit produced raw materials that were of great importance in the fight to defeat Hitler. The Germans did make an attempt to bomb Walton Pit, but ‘they missed’. There was a bomb crater in the field across the road from the Woodyard, near ‘the quarry’ – an old clay pit that in the 1950s was filled with water. They missed by quite a bit – terrible shots. After doing hard shifts to bring a critical and important strategic wartime resource, coal, to the surface – these men of the Home Guard did their duty to their country. They must have been absolutely knackered, but they turned out in uniform for the duration of the war. 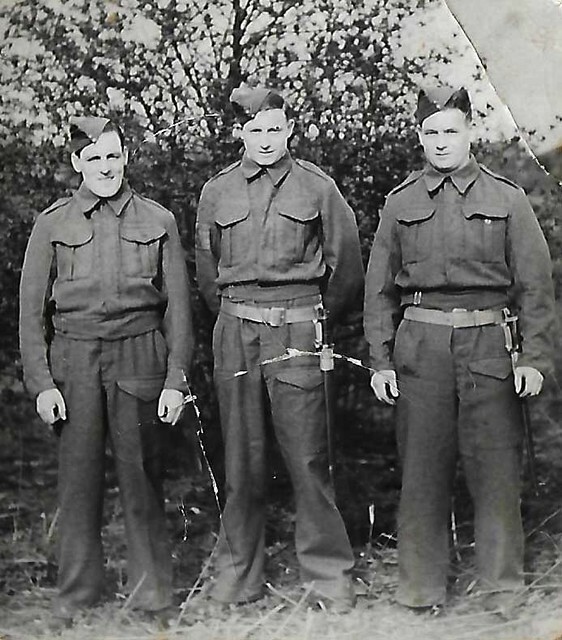 The men in the picture from left to right are: Albert Knowles, Jack Williams and Tommy Williams. Please note, the story above is a bit tongue in cheek in parts as the Home Guard, according to many of those who were part of it, was indeed very much like the way it was portrayed in the BBC sitcom Dad’s Army. I add this point in order to clarify the situation from the point of view of historical accuracy. If Germany had actually invaded in 1940 we would more than likely been in very serious trouble. This entry was posted in Family History, History, Local History, Local interest, Photography and tagged Dad's Army, History, Home Guard, Local History, World War II by cjknowles1972. Bookmark the permalink.